Trim the end from the broccoli; cut the broccoli lengthwise into ½-inch-thick spears. On a sheet pan, toss the broccoli with oil and season with salt and pepper. Spread in an even layer and bake, stirring halfway through and sprinkling with the almonds, until the broccoli is tender, 18 to 20 minutes. While the broccoli cooks, prepare the sole. Pat the sole dry with a paper towel; season with salt and pepper. Crack the egg into a shallow bowl. With a whisk or fork, lightly beat until just blended. In another shallow bowl or plate, spread the almond meal in an even layer; season with salt and pepper. Dip the sole into the egg; let the excess drip off, then dredge in the almond meal, coating both sides. In a large frying pan over medium heat, warm 1 to 2 tablespoons oil until hot but not smoking. Add the sole and cook, turning once, until golden brown and just cooked through, 2 to 4 minutes. While the sole cooks, prepare the remaining ingredients. Cut the lemon into wedges; set aside for garnish. Strip the parsley leaves from the stems; coarsely chop the leaves. Set aside for garnish. Toss the cooked broccoli with the preserved lemon. Transfer the sole and broccoli to individual plates. Top the fish with the romesco and parsley and serve with the lemon wedges. Every week our staff nutritionist, Kaley Todd, picks her favorite of the week’s recipes. She looks for a balance of great flavor and good-for-you ingredients. She found just that in our lighter take on the French classic sole amandine. 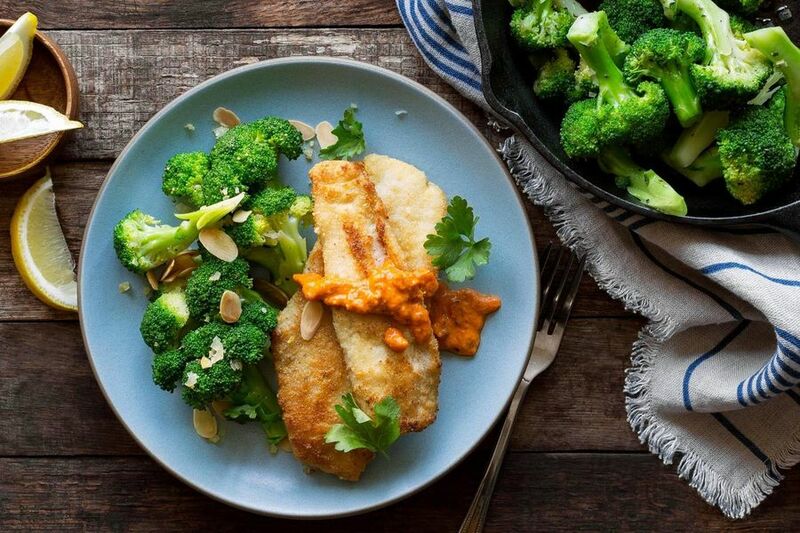 We give the delicate fish a light dusting of heart-healthy almond meal instead of plain white flour, then serve it with more almonds ground up in our customer- favorite romesco. Broccoli florets (tossed with sliced almonds) bring a hearty dose of immunity-boosting nutrients, including folate, vitamin C, and vitamin K.
Calories: 510, Protein: 31 g, Fiber: 10 g, Total Fat: 37 g, Monounsaturated Fat: 17 g, Polyunsaturated Fat: 4.5 g, Saturated Fat: 4.5 g, Cholesterol: 135 mg, Sodium: 910 mg, Carbohydrates: 21 g, Added Sugar: 0 g.